Emplicity can help to ensure that you’ll be fully prepared when, and if, injuries occur. We provide a full spectrum of Workers’ Compensation programs, designed to help your employees recover and return to the job as quickly as possible. We’ll also support you with governmental regulations and reporting requirements, while minimizing your exposure to liability. Those injured need sufficient time to recover. By implementing a comprehensive return to work program, Emplicity will let employees know their exact coverage upfront in the event of an occupational injury. Federal regulations require the reporting of all injuries and occupational diseases. 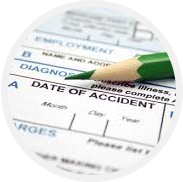 When an injury is reported, our system will automatically record all appropriate entries to the OSHA log, ensuring you are in full compliance. Through our stewardship and vigor, the Emplicity/Zurich Workers’ Compensation Program has delivered savings to thousands of client locations over the past 15 years. Participating clients must demonstrate a commitment to safety, with incentives available for large accounts. Some industries excluded. Ask a consultant for the details. After a thorough analysis of your worksite and records, Emplicity will establish or update your injury and illness prevention plan. Inspection, training, investigation and general guidance is provided at the highest level to promote a safe and productive work environment.